This paper addresses the buffering function of financial slack (understood as the pool of available resources) in the company from risk management perspective. The main purpose of this paper is to study the relationship between financial slack and risk retention, as one of risk management strategies. Risk retention is here considered as a risk financing method, whereby a company intentionally assumes the self-sufficient coverage of the negative financial outcomes of risk. The paper offers an original, conceptual model of the assessment of the company’s risk retention capacity, as determined by the existence of financial slack. It considers more-in-depth three main strategies of risk retention: earmarked capital reserves, compensation and contingent financing and links them with the three types of financial slack: available, recoverable and potential one, respectively. The contribution of the study is manifold. Firstly, it defines and systemizes the category of a financial slack in the broad meaning, together with its measures. Secondly, it offers an original, conceptual model of the application of the financial slack measures to the assessment of the company’s risk retention capacity. 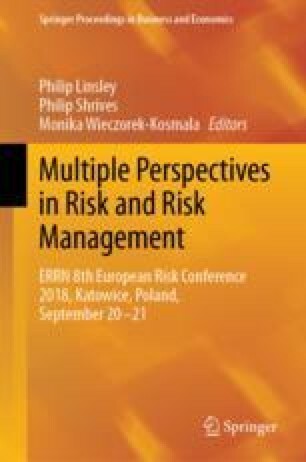 Finally, it provides the empirical illustration of the sector-relativity of the existence of risk retention capacity, based on the financial data of the 500 largest Polish companies. This empirical illustration is executed separately for each of the distinguished risk retention strategies and linked to the presence of a various types of financial slack.